Write on this bunting with chalk to create your own special messages or decorations. A very fun bunting that you could even let your children help design. Each pack contains 24 paper flags and approx. 3.8m of twine. This awesome chalkboard paper bunting is made from thick black paper which you can write on with chalk to create your own special messages or original designs. Each pack includes 24 bunting flags and black and white twine for easy threading. This bunting is a great option when you cannot find the celebratory message you need. You can also draw on your own designs and not include any message at all. They work perfectly for a monochrome themed party, Halloween, a Mad Hatters Tea Party or Alice in Wonderland party, zebra or safari themed party, construction party, pirate party and more! A fun idea for a kids party is to give your child a box of coloured chalks and the flags and have them design their own bunting. They can draw different images on each flag. You do not need to decorate all flags within the pack either, they still look great with only a few flags drawn on. 24 bunting flags is more than you will need if you are wanting to decorate a smaller party space or add a bunting behind a party table or buffet. This will give you some spares in case you make a mistake or some extras which you can use next time. Whilst you will be able to wipe the chalk from the black paper, it will leave a chalky smudge so you may find you want to use the backs of the paper if you reuse the bunting again. These are a great price and a good size so you can have fun with it either way! 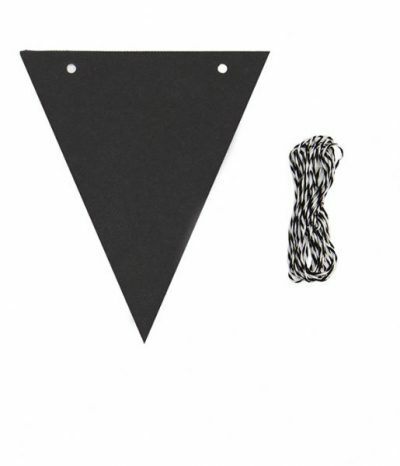 This chalkboard paper bunting qualifies for our small item shipping fee! If this is the only item in your shopping cart then our small item shipping fee will apply.